The proposed map creates a starry sky image corresponding to the current time and given coordinates of the terrain. For Moscow, the coordinates of Exhibition of Achievements of the National Economy - 55.83 ° N and 37.62 ° E were chosen. When using the map, it should be taken into account that the local time in Moscow differs from the zonal Moscow time, counted from the Greenwich meridian, on average 30 minutes. Figure 1 shows: the winter starry sky and the region of stars that never enter the latitude of Moscow.. Inside this region are six constellations that do not extend beyond its boundaries: Ursa Minor; Draco; Camelopardalis; Cassiopeia; Cepheus and Lacerta - they are called circumpolar stars. Fig. 2. Map of the starry sky over Moscow - to enlarge the map click on the "Expand" icon in the upper right corner. You can also change the time and geographical coordinates of the terrain in the upper left corner of the map. Directly to the south of the non-incoming constellations there are partially setting constellations, such that at least one of their stars falls into the polar circle of non-passing stars. Further to the south follow the setting, visible, completely constellations within the boundaries adopted by the International Astronomical Union. And at the southernmost horizon there are visible partially constellations, those of which, due to the horizon, sometimes show at least one star. Thus, in the Moscow sky you can find stars from 63 constellations! from December 27 to January 29 - Lynx. In total, 10 constellations pass through the zenith. 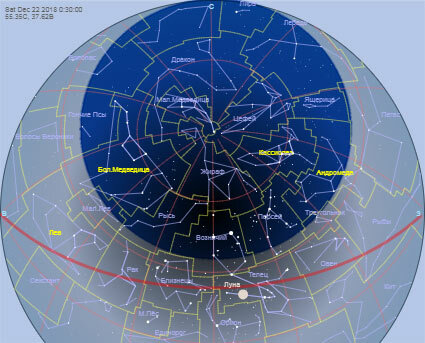 - A panorama map of all the parts of the starry sky that can be viewed from Moscow. © "Planetarium online as a map of the starry sky over Moscow - Планетарий онлайн и карта звездного неба над Москвой" - 01 января 2012, обновление 25.05.2018.